African cuisine is as diverse and fascinating as the continent’s history, cultures, and traditions. With a combination of tastes and flavours, the continent is an absolute foodie haven. If you set foot in any of the following foodie destinations, don’t leave without treating yourself to these delicious foods. Jumia Food shares some of these destinations. Nigeria is the most populous country in Africa. So, it should not come as a surprise that it has a very rich food culture. The country boasts a delicious array of traditional foods – a combination of meat, maize, vegetables, and spices. You’d be doing yourself a disservice not to try dishes such as jollof rice, eba and egusi soup. If you want to experience the best tastes of Ghana, you should try the street food. Chichinga, probably the most popular street food in Ghana. Made from beef, chicken or sausage with a peanut-spice rub or ground spices, the chichinga is a true embodiment of Ghanaian taste. However, if you fancy something more solid and filling, then banku is your best bet. Africa’s oldest independent country offers the best of both worlds: an ancient cultural heritage and a unique, delicious cuisine consisting of vegetables, spicy meat, and varieties of bread. The best known Ethiopian food is probably injera, normally eaten with meat, lentils, beans, and vegetable sauces. Angolan cuisine has a great resemblance to that of Portugal because the former was colonised by the later. 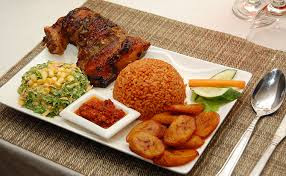 Notwithstanding, you will discover a delectable assortment of dishes that are uniquely African. The most common ingredients in Angolan cuisine include cassava, peanut, maize, and chilli. Chicken and seafood. Kenya offers a variety of yummy dishes and one of them is nyama choma (roasted meat). Nyama choma is always good companions with a relish of thinly sliced raw tomatoes and onion, and goes down well with a cold local Tusker beer. Zambia’s cuisine mainly features carbohydrates, and the country’s staple food is maize, mainly served in the form of nshima, a meal made from ground maize and has the appearance of thickened porridge. Never leave this South African country without having a taste of nshima.